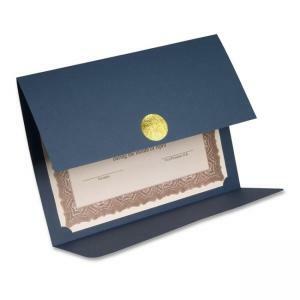 First Base 83534 Medallion Linen Certificate Holder - 8.50" x 11"
Unique double-fold certificate holder features a silver foil medallion that acts as the closure, completing the presentation. FSC Certified 80 lb. linen cover stock is acid-free and lignin-free and contains 30 percent post-consumer material. Holder accommodates 8-1/2" x 11" documents and measures 9-1/4" x 12-1/2" when folded.